Together with Rudolf Caracciola he belonged to the most famous automobile racer before 1945, his early death made him a legend. The man I am writing about is Bernd Rosemeyer. When he finished school he got an education as a technician at his father's garage. Already at that time he used the opportunity to demonstrate his abilities on motor-bikes and he soon attracted attention by his tricks on bikes. Bernd Rosemeyer started his career as a driver in 1930, at first with bikes for NSU und DKW. When the National Socialists seized power he joined the SS probably because of career reason. He was never active in their services. In 1934 he could make first experiences by car racing when he took part in the race "2000 km thru Germany". One year later he left the world of bikes and concentrated to the cars. He became a permanent driver for Auto Union and was able to win his first race on the Masaryk-Ring by Brünn. The final breakthrough followed in 1936 where he won many races and became European Champion. Already in this year he set a new record for high-speed. Together with his permanent rival Caracciola they incited themselves to top efficiency. Among others Bernd Rosemeyer was the first driver who broke the speed limit of 400 km/h. When Bernd Rosemeyer got married with the also very popular aviatrix Elly Beinhorn, they became one of the most dazzling prominent pairs of Germany who were welcome on many huge causes. When the counterparts Carracciola and Rosemeyer again tried to establish a new high-speed record in January 1938 the destiny stroke hard. When Carraciola finished his record drive - he set a new record with 432.7 km/h - he gave Bernd Rosemeyer warning of upcoming blasts. 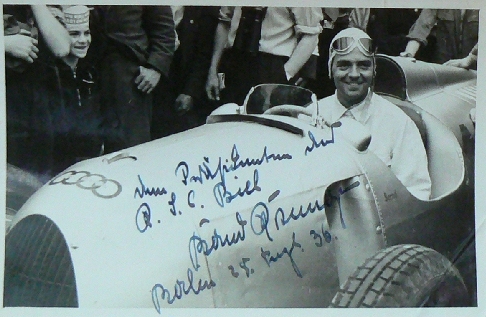 Still Bernd Rosemeyer he geared himself up to break the just established record of Carracciola with his Auto Union. On the run Rosemeyer's car was caught by a blast and threw the car off his course, turned sideways and flipped over several times. At the same time Bernd Rosemeyer was thrown from the car and died on the spot - he was only 29 years old. His death was used by the National Socialists with a huge farewell enactment and said goodbye to a hero of Germany. The myth Rosemeyer has survived till today and he still is regarded as one of the best drivers of the world rightly.